Here is the house we all stayed in. It was nice to be together. We got up at 3am to head back to Bozeman to fly out. Kelly got up to see us go. That was nice - to have someone say good-bye. I think this picture looks a little fake, but we actually did take it! 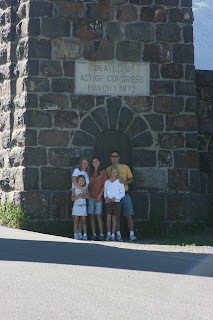 This is my last blog picture of the year and of our Yellowstone trip. 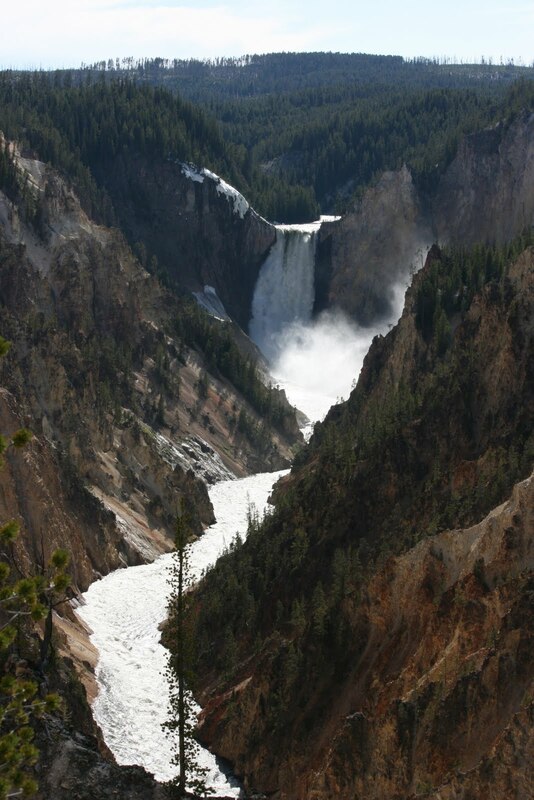 The "Grand Canyon of Yellowstone" was beautiful! There are 2 waterfalls that discharge an amazing amount of water with incredible force. This site, Artists Point, is probably the second most iconic site in Yellowstone (after Old Faithful). It was breath taking. On Monday, our last full day in Yellowstone, the rafting company called and said they would take us down the canyon. That was a great ride! The front 6 paddlers (David & Paul, Me and Kelly, and Joel and Suzanne) plus Megan and Jordan were soaked after hitting the first rapids. What a rush! 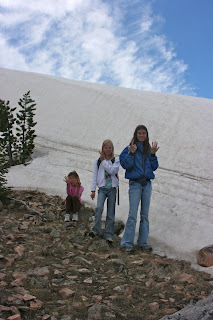 Alyssa didn't make this trip with us - she would have done fine, but she stayed back and played with the cousins instead. Here is little Hannah! She is so cute! We had fun playing with her, holding her, and feeding her. It was pretty windy up top, but the view was amazing. We saw a herd of bison, probably at least 75 of them, holding up traffic. They looked like little ants from this height. David was working pretty hard all the way down the trail to get Annie to warm up to him. Finally, during the last 1/2 mile, she held his hand, then let him carry her. He knows more about Angelina Ballerina now than he ever has! On Saturday, we were suppose to do a full day white water rafting trip, but the water flow in the Yellowstone River canyon was too fast, so we only rafting the first half of the course. It was great! I'm so proud of my girls. They really have little fear of situations. I'm so glad that they don't let fear of the unknown stand in the way of adventure. Since we were only going to do part of the rafting trip, we took the girls horseback riding. Alyssa has been wanting to ride. She deemed this activity a 9 out of 10! As we drove up to the stables, she said, "I hope I get to ride the white one". On my birthday, we went back to Old Faithful to have lunch at the Old Faithful Inn. On the way, we stopped at the Prismatic Springs and the Artist Paint Pots. Those were very cool sites that I'm so thankful that we didn't skip! After lunch, we took a hike up to the Mystic falls. It was a great hike! At the top, we were greeted with snow and were able to cool off a bit. The view was amazing! On the hike, we saw a bunch of marmots. They are a pretty cute bunch of critters! On a side note, I had a goal to be back to my pre-pregnancy weight by my 40th birthday (it's been nearly 16 years, so it is well past time!). I not only made my goal, but exceeded it by 2 pounds! I know I'll never be the same shape again, but this is something! Here she is, Old Faithful! Now, that is a bunch of water being spewed! 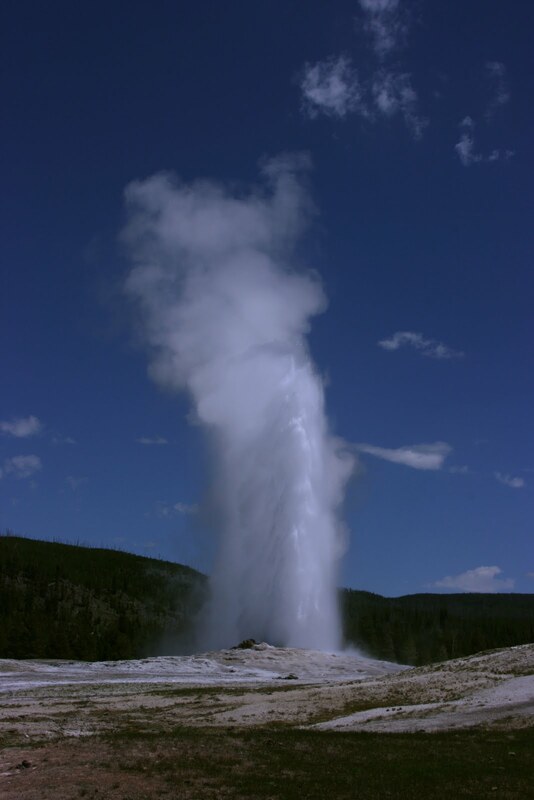 The geyser erupts every 60 - 90 minutes depending on the length of the last eruptions. If the prior eruption lasts less then 2 1/2 minutes, it is predicted that it will erupt again sooner. If there is a longer eruption, greater than 2 1/2 minutes, it will be close to the 90 minute mark. There are quite a few geysers in that area. We also saw a very neat display in the kids science area. The hot springs are different colors based on what bacteria grow there. The type of bacteria is dependent on the temperature of the spring. That is all very logical. The interesting point, for me anyway, was that the red bacteria grows at 110º, yellow at 120º, and blue at 198º. So the blue water is the hottest. Here is one of the MANY buffulo. I wanted to reach out and groom them! Most of the bison were shedding in sheets of fur. We have arrived! 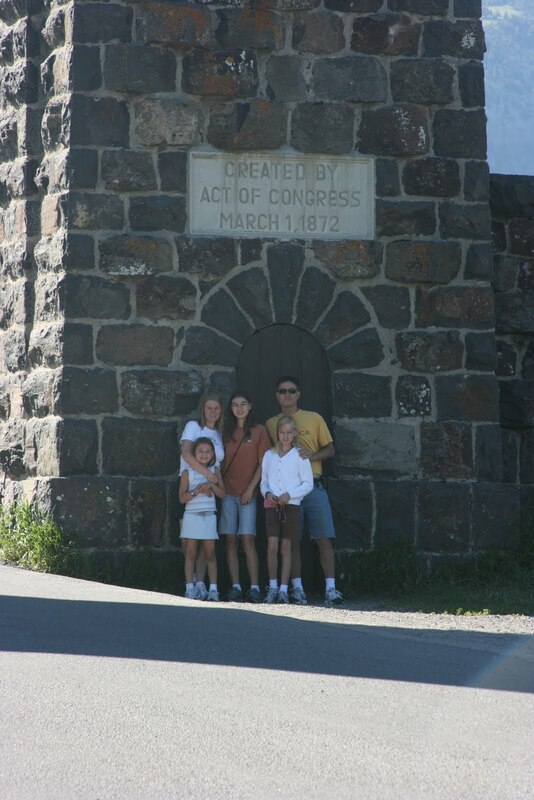 Here is the family in front of the North Entrance to Yellowstone National Park at the arch where President Roosevelt gave his dedication speech. It is a pretty impressive sight!. Today we went to Mammoth Hot Springs. We didn't see much wild life there, a few elk in the distance, but nothing close. On our drive around a bit, we saw this black bear, lots of bison, a grizzly (in the far distance), snow, and, on a hike, we stumbled upon a small herd of elk. We were so close that we could still see the fuzz on their antlers. Welcome to our family's Project 365. I've committed to taking one picture a day - every day - throughout this year. I think it will be fun to see where our journey goes this year!